Nail fungus (Onychomycosis) is an unpleasant disease that develops for several months and even years, it can lead for losing of the nail plate and infection of the skin around. Lots of people live with a fungus for years and do not associate a poor state of health with the appearance of the nail plate. Spores of fungus can be found on common objects, so if someone in the family suffers from onychomycosis, they need to treat the whole family for preventive purposes. 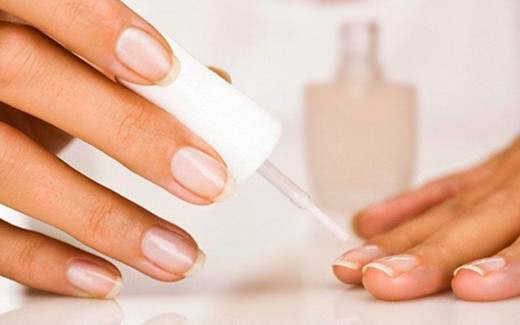 The home method of determining the nail fungus: Tap on the nail of hydrogen peroxide, if you see a reaction in the form of bubbles, then it will be better for you to check the skin or fingernail from the doctor. How does the fungus manifest? If you do not start to treat the fungus in time, it will spread to the skin. Yeast fungus- is due to the causative agent Candida. In the absence of treatment, the bed on nail plate begins to peel off. Then the nail plate becomes dark brown. The plate can peel off. Dermatophyte- fungus, provoked by pathogens: Trichophyton spp., Microsporum spp. and Epidermophyton spp. It accumulates under the nails and provokes yellowing and flaking of the plate. If the fungus is not treated, surgery may be required. Moldy fungus - infecting with this kind of fungus, the affected nail plate becomes brown, and the infection can be local, and not spread to the entire nail. The nail plate is covered with bumps and spots. When the first signs and suspicions of onychomycosis appear, it is recommended not to practice self-treatment, you need to consult a dermatologist. Buy drugs to treat the fungus can be in the pharmacies chain stores "Ruble Boom" and 1b.ru. At the first stage, the doctor will prescribe an antimicrobial agent. If the fungus in the initial stage - externally, and if the treatment is very neglected - inside. The minus of such treatment is the high toxicity of the drugs. Some of them settle in the liver and are not taken out immediately. In the treatment of antimicrobial agents, treatment should not be discontinued as soon as an improvement occurs. External funds continue to be used until the doctor allows you to stop treatment. As higher the dryness of the skin (affected areas), as fatter the preparation should be. In time of treating fungus, doctors recommend not to use them simultaneously with antibiotics, which provoke fungal growth and weakening of immunity. Before applying an ointment or cream, it is necessary to treat the foot with an antibacterial standard. Azols - this group of drugs effectively fights against the fungus on the legs (the drug is applied to the affected area). If you want to buy an antifungal agent in the pharmacy "Ruble Boom" and 1b.ru, you should consult a doctor who will help you choose the medicine with the optimal composition. The doctor may prescribe medication inside or outside. In the early stages, the fungus can be treated locally with the help of special lacquers, which are soldin pharmacies"Ruble Boom" and 1b.ru. Introduce an antifungal agent into the nail. This procedure will effectively eliminate the fungus. There are many types of antifungal varnish. In time of using nail polish, it is recommended not to use another remedy for treatment at the same time. It can neutralize the effect of lacquer. Also, in time of using varnish for the treatment of fungus, it is recommended to use disposable instruments. Apply varnish at least once a week. With caution apply lacquer in violation of blood circulation. Antifungal antibiotics are used in extreme cases, if local treatment is not effective. Self-medication with antibiotics is not welcome, it fraught with complications. Therefore, when buying drugs in pharmacies chain stores"Ruble Boom" and 1b.ru need to produce a prescription. take with yourself rubber shoes for the shower in the gym.